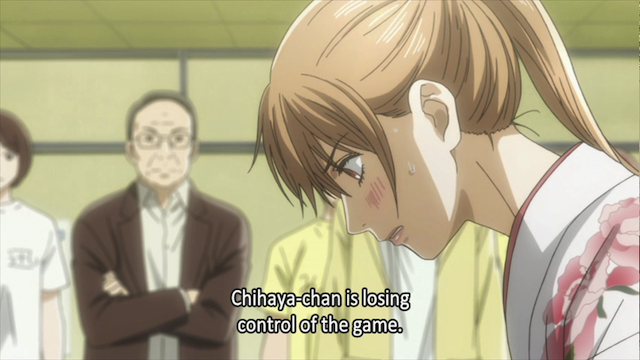 The regional championship tournament takes its toll on Chihaya and her friends. 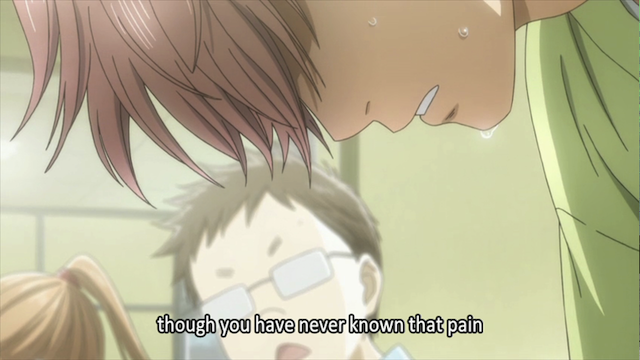 Chihayafuru is the show that keeps delivering flawless episode after flawless episode. In Episode 11, our protagonists are up against their toughest challenge yet, a team that habitually wins the Tokyo Regionals, and has a good shot at the National title. And, just when you thought it was safe to go back in the water, we see the return of Arata Wataya! Thanks to these Retro cards, Hokuo High has a chance to properly strategize their team assignments. One of the issues that was raised last week was how they would structure their line-up to best meet the challenge in the final round of the tournament. Chihaya’s team can’t plan the match-ups, because they don’t know how Hokuo will order their players, but Hokuo uses divination to pair up some particularly difficult matches. In general, from a sports anime perspective, going in to a big match like the final round of the regional championship, you want a team that has been built up, and you want some indication that the protagonist’s strengths are unusually vulnerable. This builds up the tension necessary for an exciting game. Kanade Oe must fight a giant. All of the match ups were good. Of particular note, however were Chihaya, who was matched against the “sadist” we met last week, Nishida, who was matched against an A-class player he knew from his youth, and Taichi, who was up against Hiro Kinashi, AKA Retro-kun, who was introduced in episode 3. In other words the three best players are all paired up in tough matches, making the outcome far from certain. Unfortunately, this is probably the last we get to see of this character. Chihaya Ayase is in a pinch! 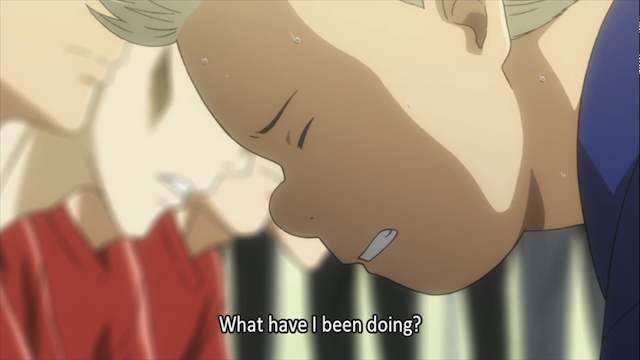 Yuusei Nishida reflects upon how he wasted his youth, by not playing Karuta. Taichi Mashima. Even Mr. Perfect is feeling the pressure. Mizusawa High School's Karuta team. Left to right: Chihaya Ayase, Tsutomu Komano, Taichi Mashima, Kanade Oe, Yuusei Nishida. But one of the great things about this episode was that it truly was a team episode. The drama was balanced amongst several characters, and all the characters had a moment, even if brief, to shine. Whereas last episode saw the team fighting individually, but lacking cohesion as a team, this episode showed that they had overcome the challenge, and grown closer by their struggles. And as if that wasn’t enough, this episode also brought back a character that has been haunting various cast members. Arata is shown finally checking his email. The way this whole section was handled was pretty funny. First he is shown doing basically nothing. The store he is working in apparently has close to no customers. 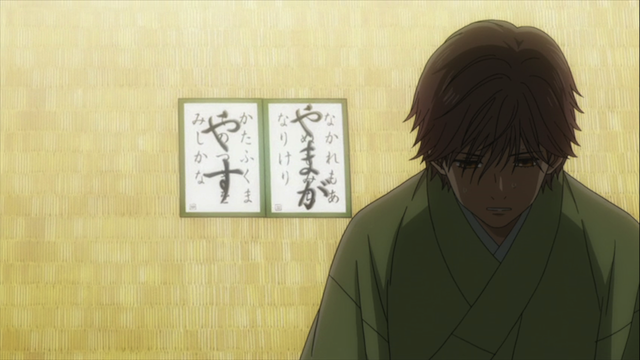 Second, we find that the reason he hadn’t been responding to Chihaya’s emails wasn’t some deep understanding between him and Taichi; it was just that his home computer is broken. In the end, we don’t get any real clue from him as to what he will do, or how he feels about Chihaya, or Karuta, but this strongly suggests that he will appear at the Omi Jingu temple for the national tournament. After all, it has to be more exciting than watching a cat sleep. Chihaya almost drained of energy. The artwork in this show is great. Watching is always a treat. I am so glad that an inspired story was put together under Madhouse, who have done some wonderful projects in the past. The direction is awesome. I truly mean that. I am always wrapped up in the episodes, and these tournament episodes have been even more riveting than usual. Consider that last week covered at least three games, but in this episode only one game filled the entire episode. Somehow last week didn’t seem rushed at all, nor did this episode seem to drag. 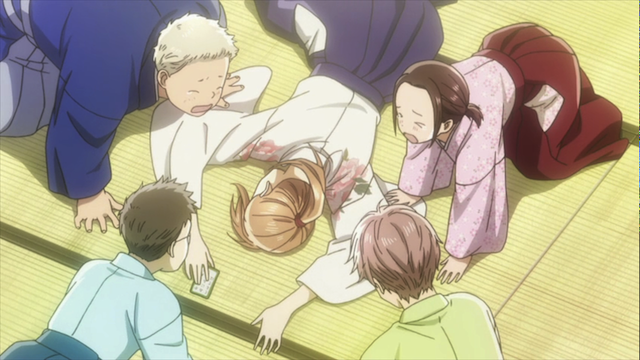 There is no doubt in my mind that Chihayafuru is the greatest show of this season, and I am very glad that it will be continuing with a second course during next season. Taichi is really stepping into the role of leader. I think his discovery that he wants to win, that he genuinely loves the game, is a real surprise to him. And it’s helping him to grow. 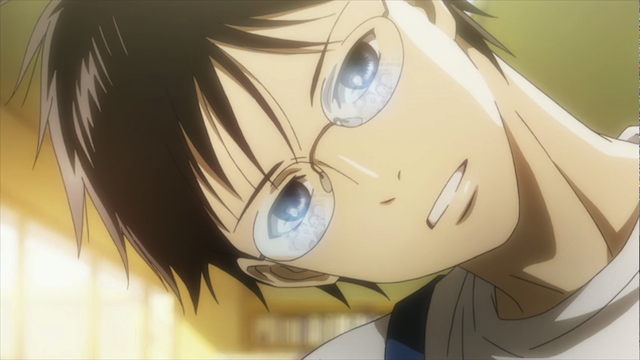 He originally thought Chihaya’s interest in the game was all abourt Arata, but in finding his own devotion to the game, he may be coming to realize that things are not that simple. He’s starting to grow beyond himself. I think his thought, “I can be the backbone of this team!” was a moment of epiphany for him. I can’t wait to see where it leads him. 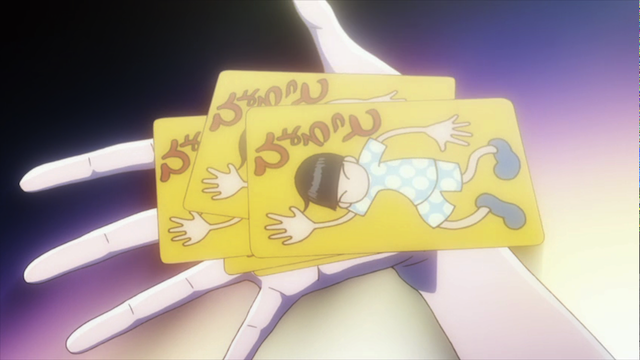 You know, wouldn’t it be a real hoot if Arata never did actually show up or play again? If he ended up being this character who started all these other people on this path, but never really joins it himself again? If the most we ever see of him is in little snippets like this episode? Not gonna happen…but it would be kind’a cool. Talk about confounding audience expectations! That would be funny. I loved the way, after teasing us for weeks with Arata as larger than life, they show him standing around while a cat sleeps. 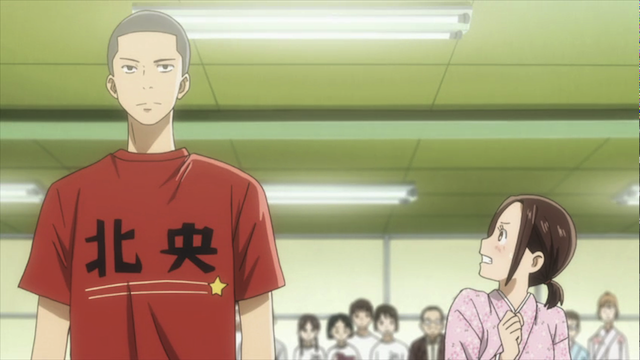 He didn’t even comment on Chihaya’s team winning, he merely looked at the picture. 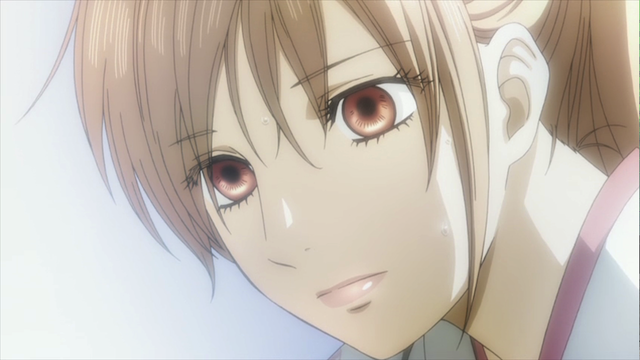 Finally got around to watching Chihayafuru and I’m glad I watched it before anything else this week. I really am enjoying the team aspect the anime has taken in these past few episodes and is probably one of the biggest reasons why this has been my favorite episode thus far. I can’t wait to see the next few matches at the national tournament. Yeah, there is an interesting story arc about the team, from the time before the team exists to their current success. It is interesting to me that the early episodes are, on the one hand, about a completely different situation, but they are tied into this phase of the story. 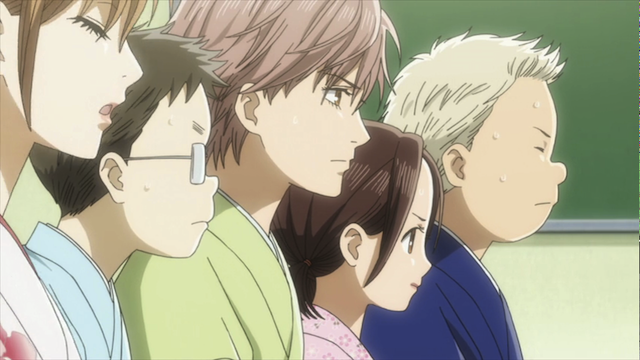 Chihaya’s experiences of having fun with Taichi and Arata are directly related to why she wanted to put the team together. 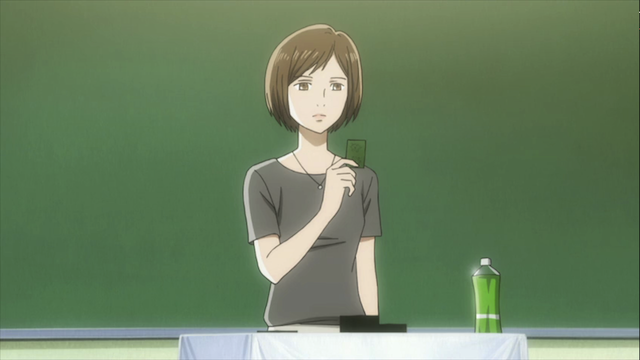 This section becomes the culmination of her childhood dream to be on a team playing Karuta alongside her friends. That’s one of the things (maybe the main thing) that makes this series so fascinating. It’s almost like every few episodes it changes genre, and yet every change of tone fits into an overall story arc. So far, this is a superbly written series. Yes. It’s a real treat to watch it. Good point on how essential those first few episodes have been to the series as a whole. Still, I’ve found these recent episodes to be more enjoyable than the first three. Not sure why, if it’s the karuta matches, the different styles of drama, the level of comedy, or the fact that they’re teenagers rather than children. There’s something that changed in this anime recently that has rejuvenated my enthusiasm in this series. I was hooked on this show from the start, but I was particularly interested for two reasons: 1) I knew, from the opening, that we would be returning to the high school years, and 2) I thought it was really interesting that one of the main characters (Taichi) was such a jerk. But one of the great things about this episode was that it truly was a team episode. Yes! Loved the way we got into all of their heads at least a couple of times in this episode, I found Nishida’s thoughts on wasting his youth by almost giving up on his love of Karuta particularly touching. And it was also nice to see the other teams and their members as interesting individuals too, as opposed to just typical villain figures, defo opponents worthy of respect. And Arata… well, let’s just say I’m glad he’s back!! Yeah, a really fun episode with indications of more good things to come.